KMC's X11 series offers great advantages on your Campagnolo 11-speed system, such as very high durability, light weight and easy to mount connecting link. I have been running KMC chains in different guises for many years now and as always you cannot fault the qaulity of the product. Light, well made and pretty silent in use. Top product, excellent delivery and excellent pricing from Merlin. Seems well built easy to size and fit and the gold is striking. Chain turned up as per the estimated eta. KMC are some of the best chains around hence Shimano get theirs made by them. In the gold colour it jazz's up any drivetrain with a splash of colour and works as good as it looks. The Ti Nitride coating resists corrosion very well and on di2 and 1x systems the outer plates retain their oh so appealing looks. At this price it's a bargain upgrade. Easy fitting light and great looking. Goes especially well with my titanium frame. Paired with ultegra Di2 and the shifting is absolutely flawless! Silent and smooth. Sometimes I check to see if I've actually changed gear! It looks good on my bike. Easy to work with and wasn't over lubricated with that shipping gunk that gets everywhere and is a pain to remove. BEST chain ever! I've used KMC gold chains for a few years. I was hooked after first ride, massive improvement in shifting and chain noise. Can't go wrong with any KMC chain but the gold versions are the BEST! Great chain that really adds some bling to your bike. Looks fantastic and works great. Came with KMC's easy-to-fit missing link, so installation is simple. Seems to shift just as well and run as quietly as any other chain I've had, too early to tell if it lasts as long as my previous Shimano item. Looks real nice when it's clean! So far, very happy. Shifts very smooth and quiet. Not just bling! Straight forward to install with "missing Link". Having used these products since 2012 it is clear they wear more slowly than other chains. Excellent chain. I would normally buy either the EL or the SL. They feel the same and it feels like the EL lasts longer. Use these chains as they last longer and are not as fragile as Campag. Also I like the connecter, as I swop chians around for wear and cleaning. Have used you before and will again. 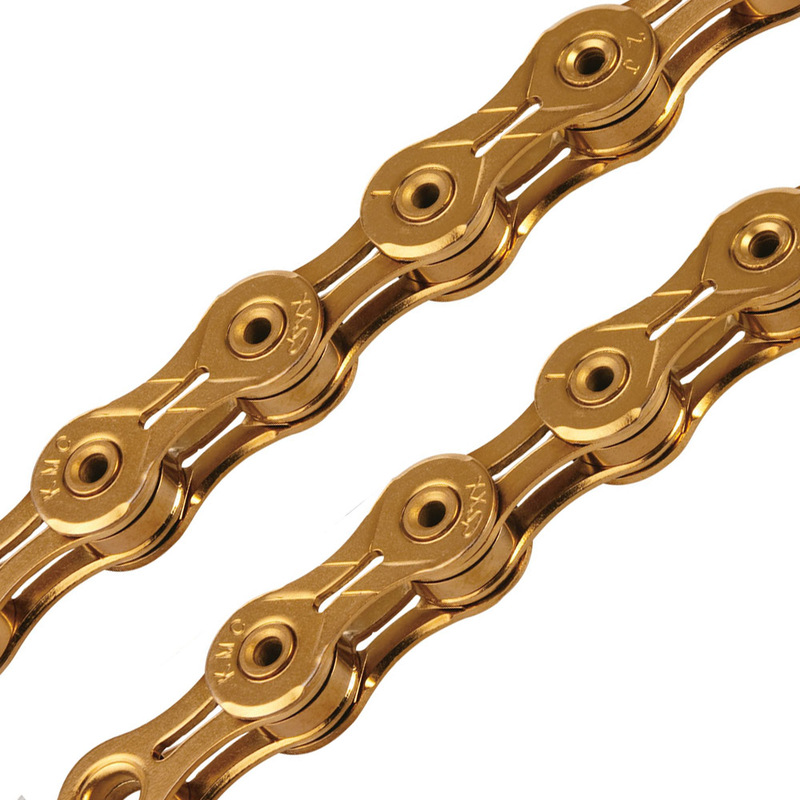 Always use KMC chains for their long life and this one was a great price and in GOLD!! !